A watershed , or river basin, is all of the land whose runoff flows into a particular stream or river and its tributaries . Watersheds of different sizes support different kinds of natural communities . Rivers in large watersheds tend to have bigger floods, leading to wider floodplains, than creeks in small watersheds. Most of Rock Creek Park is in the Rock Creek watershed, which includes much of the land in northwest Washington, D.C., and also extends north into Maryland. 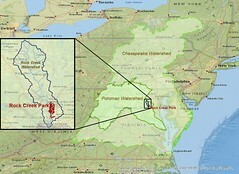 The Rock Creek watershed is nested inside the Potomac watershed, which is nested inside the Chesapeake watershed.The watershed of Rock Creek is just one of many that makes up the much larger watershed, or river basin, of the Potomac River. The Potomac River basin in turn makes up part of the Chesapeake Bay watershed. Groundwater also supplies some of the water in Rock Creek, which is why the creek doesn’t dry up even during extended droughts. From its headwaters in the Piedmont near Laytonsville, Maryland, Rock Creek flows southward for 33 miles to its mouth at the Potomac River in the Coastal Plain . Rock Creek enters the park at the border between Chevy Chase, MD, and Washington, D.C., and winds through a narrow forested valley for six miles until it reaches the National Zoo. South from the National Zoo, it flows another 3.6 miles to the Potomac, along the Rock Creek & Potomac Parkway. More than 25 smaller streams empty into Rock Creek. Because of a slight eastward tilt of the regional landscape, there are more western tributaries and they are typically longer than eastern tributaries. Western tributaries include Pinehurst Branch, Broad Branch (and its tributary Soapstone Branch), Melvin Hazen Branch, Klingle Valley Creek, Normanstone Creek, and Dumbarton Oaks Creek. Eastern tributaries tend to be short, steep, intermittent ravines that barely extend beyond the park boundary. Major exceptions are the longer eastern tributaries Piney Branch, Fenwick Branch, Portal Branch, and Luzon Branch. Most of their length beyond the park borders, however, has been buried in storm sewers. Map tip: To find these tributaries, go to the interactive map of Rock Creek Park and search for them by name. See the Map Viewer Tutorial for help. Plants and animals depend on clean water in many ways, so there’s a direct relationship between the health of Rock Creek Park’s creeks and the health of natural communities. Consider how important the stream structure is: pools of deep, slow-moving water alternate with riffles of shallow, fast-moving water to provide different microhabitats. In a riffles, water flows over gravels and cobbles , which provide nooks and crannies for fish to lay their eggs and for aquatic insects to find refuge from the current and predators. Riffles aerate the water, supplying gilled creatures with oxygen. Rock Creek provides other services beyond providing water and habitat. The creek and its tributaries erode various types of bedrock , exposing the numerous minerals and elements in the rock and making them available to plants as nutrients . The flowing waters also carry sediments far downstream of where they originated, bringing in minerals and nutrients that might not otherwise be available. Two natural communities that thrive along the floodplains of Rock Creek and its tributaries are the Tuliptree Small-Stream Floodplain Forest and the Red Maple Seepage Swamp. These communities can withstand flooding, and benefit from the nutrients deposited by floods. Ecobit: Rich but Hard to Live With Animals, in turn, depend on the diversity of plants that these nutrients support. Map tip: to locate examples of these natural communities that you can visit, go to the the interactive map of Rock Creek Park and search for "good places." Some green spaces under the administration of Rock Creek Park are located in other watersheds in the D.C. area. Map tip: Search for these streams by name on the interactive map of Rock Creek Park. 1. Anderson KM. 2013. River Life: the Ecology of Flowing Water.